Kathy always had a strong sense about animals. I guess she comes by it naturally, our grandfather was one of the last cowboys and he was wonderful with horses. We all knew from early on that animal training would figure predominantly in Kathy's future. The photo to the right is Kathy and The Duchess. Kathy was eight years old and I think The Duchess was eight as well! The other give away is the hand on the hip, the slack lead and The Duchess free stacked and looking to be judged. 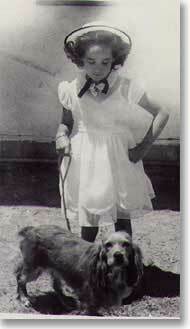 As the photo shows that Kathy had the "show dog" stance down pat. We were "military brats" and traveled more then we stayed in one spot. Having a pet was very limited. Dad was stationed in El Centro when this was taken, we were there for almost 18 months. So during that time we made the best of it having the pets we wanted. Kathy had her Duchess, Mom had her bird, I loved the cats and Dad was happy that we were all happy. This didn't last long because on very short orders we had to pack up and head east and eventually we were transfered to Canada. The only pet we were able to take was the bird, Tweety. for Kathy to become very, very attached. Soon Mom and Dad found and returned the little poodle to it's owner. Knowing how upset Kathy would be to loose the new found pet, Mom and Dad had made arrangements to pick up a newly purchased puppy from a local breeder. 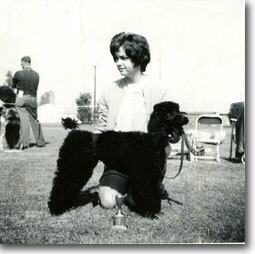 Kathy and Big John trained with Heinz Peters amongst the German Shepards and Dobermans training for the various Northern California law enforcement departments, Big John was the only Poodle. The training was outstanding and they were off to a great start for obedience, Big John won his Obedience certificate in three trials. For Kathy, the next step was the conformation ring. Below, Kathy and John compete at a puppy match in conformation and they placed first! "Big John" was brought home that same day, he was in house by the time Kathy got home from school. The bond was immediate. Everything was Big John. Everyone had to learn how to brush, walk, feed, play with and do about the new puppy. Big John was a sweetheart and he and Kathy were inseparable. The picture to the right above is a day with Kathy and John at Sutter's Fort. The little kid with them is our brother, Kevin. Big John and Kathy started obedience classes as soon as he was old enough. Kathy was very persistent about showing in conformation. But Big John was too big for the Miniature Poodle classes and really too small to be classified as a Standard Poodle after all, he was miniature breed according to his pedigree...just oversized for the conformation ring. Mom and Dad went back to Georgia, Big John's breeder, to see if she had anything that would be showable. She had just breed and whelped a litter and there was one special boy puppy she wanted my parents to consider. He was perfect, he came home with them the day they went to see him. Everything was in order and Kathy was on her way. Later, Scamp was to be our first AKC Champion: Ch. Kathy's Black Scamper. 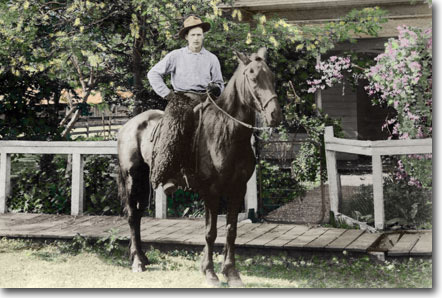 Albert Sr. on his horse at about 18 years old.